Who better to respond to a poll revolving around air guitar performances than "The Ace" Hiroshi Tanahashi? WWE recently took to Twitter in order to ask the WWE Universe, who has the best air guitar? Turns out there might be an even better contender for the title of air guitar champion. Another wrestler has stepped forward to claim this particular crown. Not “Hollywood” Hulk Hogan, no. Responding via Twitter, former-IWGP Heavyweight Champion, Hiroshi Tanahashi, would respond to WWE’s question. His response was a simple emoji of a man holding his hand up, the hashtag “#GOACE,” and a guitar. It’s rare for New Japan wrestlers to really engage with WWE social media, but “The Ace” couldn’t help himself when it came to this particular challenge. 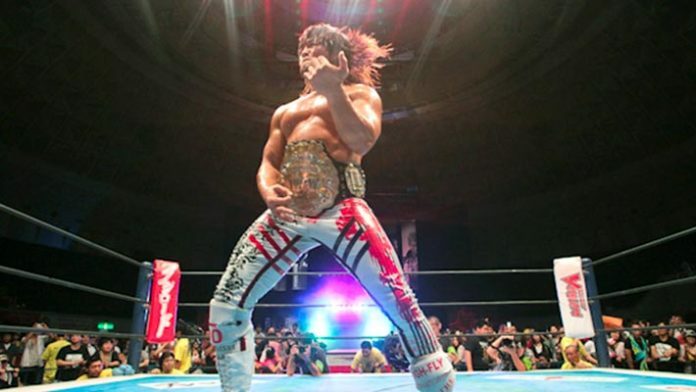 Hiroshi Tanahashi has, of course, been thrilling audiences for years by playing the air guitar after his matches, usually to close the show. Despite reasserting his “Ace” status, Tanahashi has just suffered a major loss to Bullet Club leader, Jay White. “Switchblade” shocked the world, much in the same way as Kazuchika Okada did, this past Monday when he bested Tanahashi for the IWGP Heavyweight Championship. The victory has firmly established Jay White as the top star in NJPW, with Bullet Club returning to their dominant ways. Where does Tanahashi go from here? Is it the twilight of his career, or does “The Ace” have more in him?